The 24th Annual SBAI International Graduate Research Conference, titled On the Voice: Identity, Difference, Expression, will be held on March 31, 2017, at the University of Rochester. 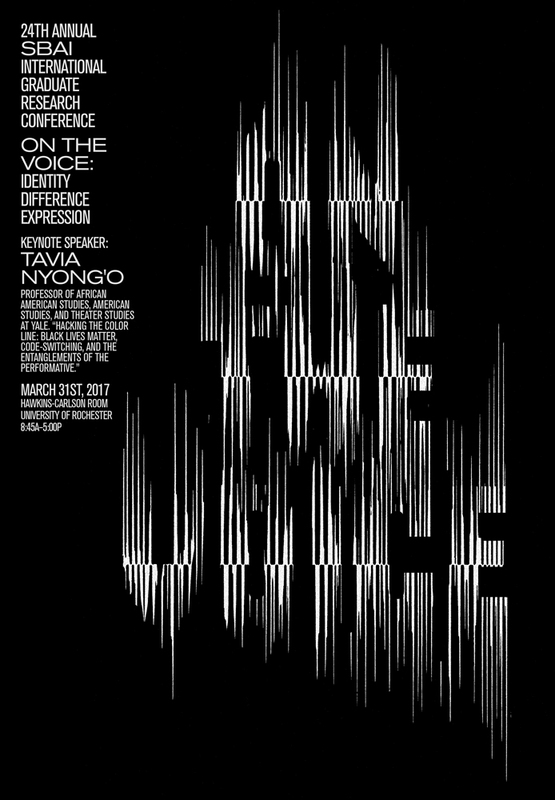 For the complete schedule, download the On the Voice: Identity, Difference, Expression Schedule (PDF). You can also download the call for papers (PDF). Code-switching has historically been central to African-American culture. In the wake of the post-racial era (an idea recently disavowed by President Obama in his farewell address), what is the future of code-switching and double-consciousness as oppositional performative strategies? The recent phenomena of Black Twitter (and more generally, of digitally encoded assemblages of intersectional black feminism) has been countered by the rise of an anti-Black Twitter, which has claimed many targets for harassment and helped elect a president. Is online activism fated to be drowned out by this “white noise”? Or will code-switching be reinvented for a digitally networked and increasingly post-literate age? This talk will investigate these questions in dialogue with recent queer and black feminist theories of hacking, coding, and entanglement. Tavia Nyong’o is professor of African-American, American studies and theatre Studies at Yale University. His first book, The Amalgamation Waltz: Race, Performance, and the Ruses of Memory (Minnesota, 2009), won the Errol Hill Award for best book in African American theatre and performance studies. He is completing a study of fabulation in contemporary black art and performance. Nyong’o co-edits the journal Social Text, published by Duke University Press, with Neferti Tadiar, Barnard. He is co-series editor of the Sexual Cultures book series at New York University press with Ann Pellegrini (NYU) and Joshua Chambers-Letson (Northwestern).